Did Martin Luther, founder of the Protestant Reformation, instigate the Holocaust with his anti-Jewish writings, including his infamous On the Jews and Their Lies? Did Martin Luther instigate the Holocaust? Call me a traditionalist, but I figure that accomplishment can stay on Hitler's rap sheet. What we can safely say, though, is, yes, the father of the Reformation did express starkly anti-Semitic sentiments in print and at great length—in the treatise you name, he explicitly advocates the persecution of German Jews, saying at one point "We are at fault in not slaying them"— and the Nazis couldn't get enough of it. Luther hardly invented anti-Semitism, but as a towering presence in German culture, he proved very useful in legitimizing the aims of the Third Reich. Always opposed to the practice of Judaism—he couldn't understand why anyone would take a pass on the Christian promise of salvation—Luther initially adopted a honey-not-vinegar approach toward its adherents. His 1523 treatise That Jesus Christ Was Born a Jew condemned the Catholic Church for its mistreatment of Jews—not for humanitarian reasons, mind you, but because he felt it made Jews less likely to convert. On the basis of this position, a Jewish advocate solicited Luther's aid in 1537 after Jews had been banned from the state of Saxony; Luther, by this time seemingly enraged at the failure of his conversion efforts, vehemently refused to intercede. 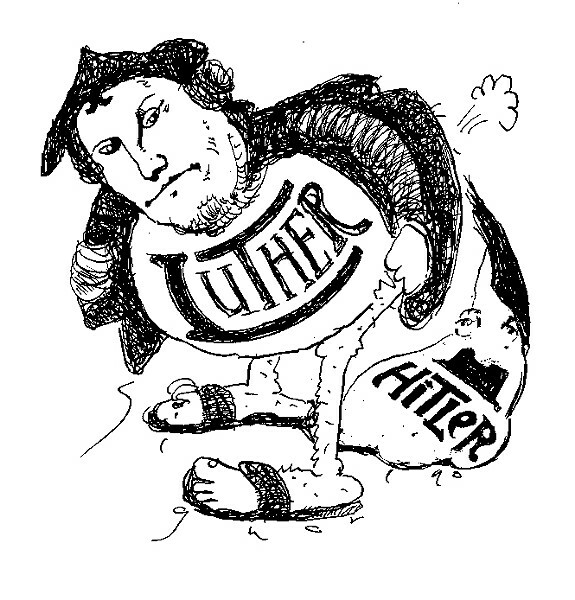 Luther's anti-Semitism reached full boil with the 1543 publication of On the Jews and Their Lies—basically a 65,000-word blast of what we'd nowadays call hate speech. After roundly condemning Jews as prideful, deceitful, indolent blasphemers, "possessed by all devils," Luther sets forth a program of action: He calls for the burning of synagogues; forbidding rabbis from teaching; banning Jews from owning homes; denying them legal protection; confiscating their texts and money; and setting them to manual labor. This diatribe wasn't a one-off, as Luther followed it up with further, equally combative treatises and a later series of anti-Semitic sermons before his death in 1546. And its arguments weren't ineffective—a reprint helped stir up a Frankfurt pogrom in 1614. In his classic The Rise and Fall of the Third Reich, William Shirer argues that here Luther had basically drafted the blueprints for the Holocaust, concluding that his "advice was literally followed." We have no proof the young Hitler was aware of Luther's anti-Semitic writings (the strongest stuff had been omitted from some editions of Luther's collected work), or that they had a formative effect on his thinking; thus we can't draw a direct line from Luther to Hitler to the Holocaust. However, it's broadly true that Luther contributed to the culture of anti-Semitism that was especially virulent in Germany (although hardly unknown elsewhere—for example in Russia, where Luther had no comparable influence). And by the 1930s at least, the Nazis were well aware of his work and used it to justify their actions. On the Jews and Their Lies was displayed prominently in a glass case during the Nuremberg rallies, and Nazi bigwigs regularly cited Luther as a kindred spirit. "No judgment could be sharper," Heinrich Himmler said of Luther's writings against the Jews; "With Luther," according to Hans Hinkel of the Reich's Propaganda Ministry, "the revolution of German blood and feeling against alien elements of the Volk was begun." Bishop Martin Sasse, prominent in the pro-Nazi German Christian movement, published a collection of Luther's anti-Semitic writings, noting with satisfaction in its preface that "on November 10, 1938, on Luther's birthday, the synagogues are burning in Germany" and calling Luther "the greatest anti-Semite of his time." Nazi newspaper publisher Julius Streicher, who had received a first edition of On the Jews and Their Lies from the people of Nuremberg as a birthday present, referred to that work in his own defense while on trial in the same city after the war: "Dr. Martin Luther would very probably sit in my place in the defendants' dock today, if this book had been taken into consideration by the prosecution." Luther's defenders emphasize that his prejudice against Jews was theological, rooted in their refusal to embrace Christianity, rather than strictly racist. But the relentless vigor with which he hammers away at "these base children of the devil, this brood of vipers" suggests more than a purely doctrinal bone to pick. As noted Lutheran scholar Eric Gritsch pointed out, Luther's description of how Jews' collective guilt for their supposed sins "still shines forth from their eyes and their skin" certainly implies some racial component to his animus. In Luther's example, Shirer suggests, Hitler found a traditional justification not just for anti-Jewish policy, but also authoritarian rule; he contends that Luther's own "passion for political autocracy ensured a mindless and provincial political absolutism" in German society. The Nazis organized Luther Day celebrations, calling Luther "the first German spiritual Führer," and enlisted his teachings to support the idea that German exceptionalism and anti-Semitism were inseparable. We have no reason to think Luther would have approved of the Holocaust. But—and this is always the danger with rabble-rousers—he set his followers on the path.